Palm operating system has been losing its positions swiftly. It used to be the leader among the operating systems for PDA, last year it yielded the first place to Windows CE and its derivatives (Palm OS share dropped from 50% to 36.6% according to Gartner reports). Let's see together, how could this happen. Palm OS 6 was promised 2 years ago and has never been released, there are only prototypes based on it. Old versions carried unsolved problems with localization and multi-tasks. The number of big makers of Palm OS driven devices has gradually decreased to a single one, palmOne. Let's recall the companies, which used to Palm OS driven devices and ceased to continue. Sony was one of the biggest players on the PDA market, but in 2004 it left the market. These are the vendors, which switched from Palm OS to Windows Mobile: Acer, Garmin, Samsung, Qool. Several years ago Palm Inc. was divided into two companies, palmOne and PalmSource. The one was engaged in developing OS and the other in selling devices based on this OS. Both companies had the right to use "Palm" brand. A month ago palmOne actually bought out Palm trademark, the deal cost US$ 30 million. Very soon palmOne will be renamed to Palm Inc. PalmSource has kept the right to use Palm trademark during 4 years. After it Palm OS will disappear totally. There will be other operating system under different name based on Linux (not long ago PalmSource has announced the switch to this open OS, it will be the core) with Palm OS emulator, which allows launching old programs. The company of palmOne makes no secret that it isn't bound up with Palm OS, there might be release of devices based on other operating systems. In near future we will see new devices, which won't be based on Palm OS. Nevertheless, the company will make Palm OS devices for quite a long time till they will be in demand. the company is still the leader on the PDA market. One of the mass models of recently was Palm Tungsten E, it became the sales hit. 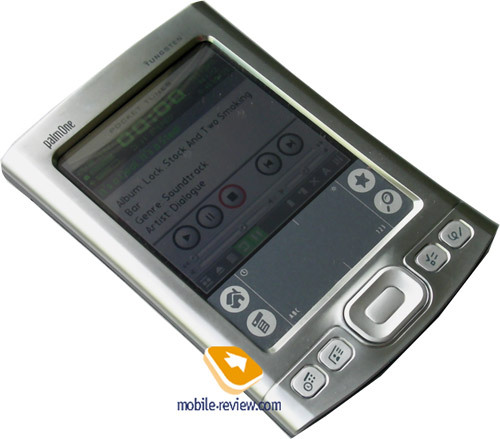 Long ago there appeared info on the successor, Palm Tungsten E2. It was awaited a year ago, even its approximate specs were known, but the model has come out only this year. Can the say it is too late? No, it is actual and will be the hit, it will enjoy the popularity of its predecessor. It's not a secret that currently the PDA market is slowing down, the world sales are ever decreasing. The budget segment suffers most, there have been almost no new models recently. To say, the average cost of the PDA in 2004 increased from US$322 to US$353 (according to Gartner). That is why any new model in the budget sector attracts attention. Several months ago our readers could learn the specs and see official photos, and today we publish the review of this device. First of all, we'll enumerate distinct features of Palm Tungsten E2 from the previous model, and provide more details farther in our review. There appeared the support of Bluetooth 1.1 - this is the key innovation in this model. All new models have NVFS file system. It ensures that no data will be lost at strong discharge. All data are stored in flash memory. The screen resolution is kept the same - 320x320 pixels, improved color rendering and behavior under the sun. It comes with Intel XScale 200 MHz CPU (instead of TI 126 MHz in the first series E model). There is another important change - instead of miniUSB we see Multi-connector. The OS version grew to Palm OS 5.4. The sales package remained the same. The manufacturer decided to keep proved design, which was inherited from Palm Tungsten E and T5. It's a classical mono block with standard location of the screen and control elements. The design is rather strict, smooth side lines do emphasize it. The shell is made of silver material, it is pleasant to touch and make the illusion of metallic surface. As a matter of fact it is a sputtered plastic. You can make sure of it, if you cut with the knife a little edge of the shell. The model looks expensive due to metal. Palm Tungsten E2 has dimensions of a typical budget PDA, but it isn't that small as the smallest Pocket PC. It measures 114x78x15 mm and weighs 133 g. You can carry it wherever you want: in a belt case or a shirt pocket - you won't feel its weight. On the front panel we see a standard set of elements: 4 application buttons, a rectangular navigation pad with Enter button in the middle. They have good size and comfortable location: it's easy to work with them. 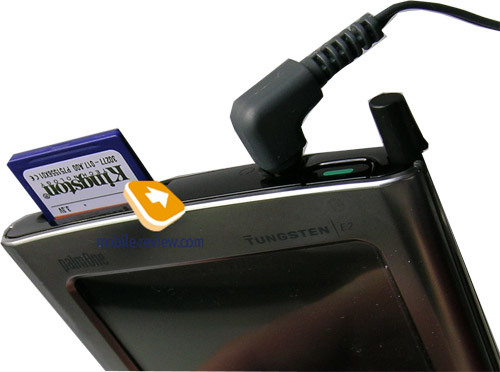 That is true for Palm Tungsten E. The company thought it right to keep proved solutions. At left and right sides are grooves to attach the screen cover and the stylus pen. Some words about the stylus. It is made of metal and feels rather heavy. Its top can be screwed out revealing a thin pivot to tap the soft reset button. The top end is made of black glossy plastic. Everything here is unchanged: a standard headphones jack (3.5 mm), an expansion slot for SD/MMC cards (it's possible to plug SDIO and Wi-Fi cards), an unnoticeable infrared port and green power button. There are no reprimands to the sound quality in headphones, the handheld can be used as an MP3-player. Instead of miniUSB plug and a charger in at the bottom end we find a Multi-connector. You can plug a keyboard or a cradle. The speaker features average sound volume and is located at the back panel. In a noisy neighborhood you won't hear the sound of the reminder. I'd note that there is no mic and as result a voice recorder button. The package doesn't include a cradle - there is only a synchronization cable. In addition there are no indicators of battery charge level and Bluetooth activity. The model belongs to the budget class, thus all these things can't be a serious flaw. 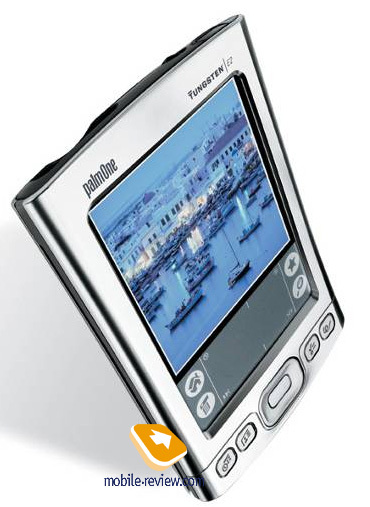 Its 3" square transflective TFT screen features a high image quality, which became the standard for Palm PDAs. The screen resolution is the standard palm square of 320x320 pixels displaying 65K colors. We tested it with LCD Analyzer 1.3 utility (www.palmary.com.hk, it allows estimating color rendering quality, color transition, evenness of backlight). Promo materials mention an improved screen and incredible brightness. We won't say that the changes are cardinal, but the screen is really good. Given the image quality (color rendering, viewing angles) it is one of the best on the market. The previous processor by Texas Instruments was replaced with Intel XScale. The highest clock rate grew from 126 MHz to 200 MHz. Palm Tungsten copes well with main applications designed for this model. The restrictions are felt only when you launch video and open large files in Documents to Go. 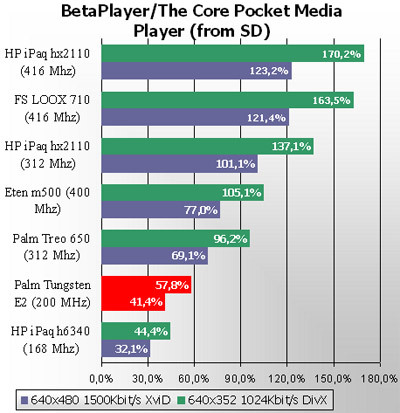 Recently there appeared Beta Player for Palm OS (called Core Pocket Media Player), it enable video playback without the conversion, you have just to write the movie to the memory card. We held productivity performance comparison with Pocket PC based on same test clips. Certainly it can't be a completely objective comparison, but nevertheless we can make some conclusions on the productivity. Let's see the results of the formal tests. They say little on the real productivity performance. We'd note one more time, there is enough productivity to manage most tasks for Palm Tungsten E2. All new models by palmOne apply NVFS file system. It prevents from potential data loss in case of strong battery discharge. All user's data and settings are stored in non-volatile flash memory. On the other side we get software compatibility problems, data occupy much space as they should have. Only 29.7 MB are available from 32 MB of flash memory. The PDA is equipped with a non-replaceable Li-Ion battery. The test results surprised us much. In the MP3 mode with the screen off the handheld worked for 15 hours 40 minutes till the battery got fully drained out. Under the maximum load Palm Tungsten E2 lasted for 4 hours 30 minutes, that's good. Not many budget PDAs can boast of such long battery life. The key change in Palm Tungsten E2 is the inclusion of Bluetooth. 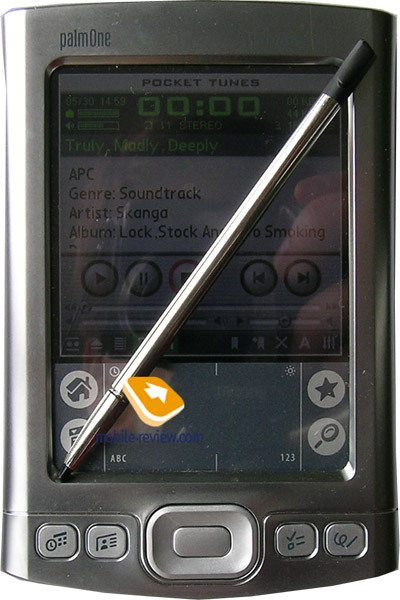 The performance of Bluetooth in the new PDA can be compared with Palm Tungsten T5, the opportunities are identical, i.e. given Bluetooth opportunities this handheld is the best among all Palm OS devices, but it still yields to Pocket PC. This handheld computer is powered by PalmOS Garnet 5.4.7. In addition to standard virtual keypad there is Graffiti 2 manuscript recognition system to enter info. Quick Tour. Quick Tour. This is an application for newbies providing a PDA tour and telling about application buttons and the Graffiti zone. Calc. It's the built-in calculator. Two versions are available: simple (basic mathematical actions) and advanced (engineer). Calendar. It keeps the working schedule. There are previews available. The so-called Agenda, an analog of the Today screen for Pocket PC, displays today's events, active tasks and unread e-mails. The second preview is for the day schedule. The rest preview modes are for week and month. Card Info. The utility displays the card information, It's possible to format the card using this utility. Contacts. Work with contacts. You can dial numbers or send SMS right from this application. You can attach a photo, there are 17 fields available (you can change some of them choosing from the list the field name). In addition there are 3 extra fields (phone/e-mail, IM and address) the user can give names to 9 fields. It's possible to add text notes. The contacts are easily synchronized with MS Outlook, including also contacts in the Russian language. HotSync. It's a PC synchronization client. The synchronization runs via USB and Bluetooth. There is no need to do or adjust anything in this program (with a rare exception of remote synchronization). Media. It views camera files, it's possible to run slideshows. You can rotate photos, add pen inscriptions, set wallpapers, copy files from the phone memory to the memory card. Memos. Text notes, nothing special. Tasks. It's useful to manage tasks. You can set priority and due date. Web (Blazer 4.0). This built-in browser does good job displaying web sites, it stretches the contents in a column. 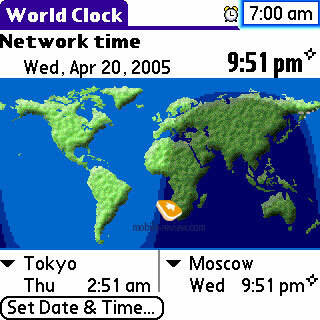 World Clock displays local time in selected cities and towns of the world. The world map depicts night and day zones. In this utility you can set the alarm clock. Dialer. Dial numbers on your mobile phone from PDA via Bluetooth. SMS. Send and receive SMS from PDA via Bluetooth. 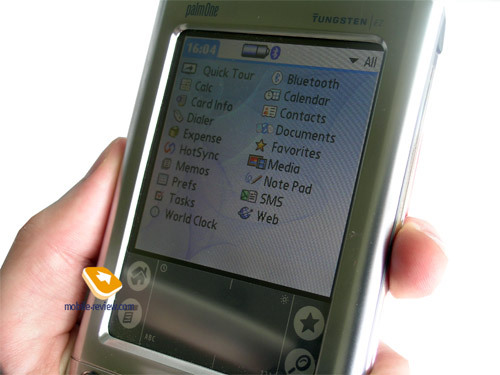 palmOne has kept the old design in its Palm Tungsten E2. It added Bluetooth module, universal connector Palm, NVFS file system, which allows keep data at strong discharge. It's a typical budget PDA - there is no voice recorder, LED indicators, the processor is junior. With the current price tag of US$230-250 the model has no direct rivals, this factor will make it a bestseller in 2005.